Charlotte Marshall, an elderly American living in Tokyo, isn’t happy. Accompanied by her daughter, Rebecca Peterson, she is visiting a local clinic. Charlotte has been experiencing some “senior moments” of late and Rebecca is concerned. Things go well at first, but when the young Japanese doctor, struggling to conduct the consultation in English, continually addresses his questions about Charlotte’s condition to Rebecca, her mother finally reprimands him: “Don’t ignore me! Talk to me, not about me.” Chastened, the doctor hastily apologizes and endeavors to include both women in the ensuing conversation. In real life, “Charlotte” is Ann Endo, a retired nurse who has raised her family in Japan, while “Rebecca” is Christine Benson, a U.S.-registered nurse currently based in Tokyo because of her spouse’s work. The doctor is actually a student at The Jikei University in Tokyo. 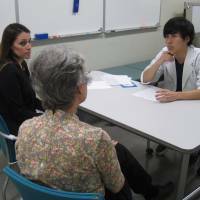 All three are taking part in an innovative program called Simulated Patients (SP for short), which matches foreign volunteer patients with Japanese medical students for role-play. It is a rare opportunity for the students to hone both their language skills and bedside manner in English. The volunteer patients, who undergo training before entering the program, are assigned identities and a case history for each session, and then attempt to stay in character while interacting as naturally as possible with the “doctor” during each role-play. The Japanese health care system is frequently praised for offering universal coverage and freedom of choice when it comes to providers. However, while appreciating such qualities, foreign nationals sometimes cite problems such as consultations being too rushed, doctors diagnosing them after scarcely any questioning and medication being dispensed without adequate explanation. Undoubtedly some of these problems lie with the way the medical insurance system is set up, but cross-cultural understanding could also go a long way in allaying patient anxieties. Ruri Ashida, a university professor, initiated SP and continues to spearhead the program. “Along with foreign nationals coming to Japan long-term for work or marriage, we have seen a recent growth in the number of overseas tourists in Japan. And with the 2020 Olympics scheduled for Tokyo, now is a very good time for the medical profession to gain a better understanding of the needs of non-Japanese patients,” she notes. The program with the first trained SPs was test-piloted in 2012 in classes at Ashida’s former workplace, Tokyo Medical University, and then in mid-2013 she introduced the program to her students at the University of Tokyo, where she is still teaching. In the fall of 2013, Ashida joined forces with Christine Kuramoto, an English teacher at Hamamatsu University School of Medicine in Shizuoka Prefecture. As there were no SPs in Hamamatsu at the time, Ashida took three volunteers from Tokyo with her. Sessions have since been conducted at several locations around Japan, including in Okayama, Akita and Tokushima prefectures. This latest session took place at The Jikei University in downtown Tokyo. The director of the university’s Center for International Affairs, Dr. Kunihiko Fukuda, invited Ashida to set up an expanded program on-site after attending one of her workshops in Akita and being impressed with the potential benefits. Currently, medical students may choose to participate in the SP program as part of their electives program. “This is a very valuable opportunity for our students, and eventually I’d like to see it included in the main curriculum, as well as offering similar opportunities to all our staff, including nurses and receptionists,” says Fukuda. Along with the chance to practice her English, one fifth-year medical student at Jikei, who asked not to be named, credits SP with opening her eyes to various cultural nuances, which she hopes to draw on when she travels to the United Kingdom and Germany this spring on overseas training. Another student said she was surprised at how much her foreign patients talked during the session. “They asked a lot of questions and liked to chat, so I was worried about running out of time and I had to try and steer the conversation back to the issue at hand,” she said. Fukuda notes that even when students are comfortable using English, there can be marked differences between daily conversation and speaking in a professional setting. “One student was flummoxed when a volunteer patient used the word ‘waterworks,’ a polite British euphemism for the urinary system. However, when the student later tried to use the same term with another patient, the person had no idea what he was talking about,” Fukuda shares with a grin. While there is growing interest among the medical community in implementing SP sessions, it has taken a great deal of time and nurturing to get the program this far. Having a ready pool of foreign patients for the program is essential. Volunteers are asked to commit for at least a year, but the longer the better as far as the facilitators are concerned. They are paid a token amount for their efforts, as well as expenses if they travel for a session, but the main incentive for volunteers is a desire to contribute to making visits to the doctor that little bit more comfortable for other foreign nationals. There are currently round 30 regular volunteers, including Australian, New Zealand, Chinese, Indian, Dutch and German nationals. Endo — who, based on her very realistic portrayal of Charlotte, may have missed her calling as an actress — has been with the program since the outset and has brought a number of other volunteers on board through her involvement with the Foreign Nurses Association of Japan and the Association of Foreign Wives of Japanese. For Briton Tim Harris, the role-playing should be second nature. The guest lecturer and actor was recruited after Ashida watched him on stage in a Tokyo International Players production. “It sounded worthwhile and interesting and so I signed on. It’s a way to give back to the community,” Harris says. Ashida would dearly love to see the SP program expand throughout Japan. Ashida is grateful that her work to date has been generously supported by university funds and government research grants, but she can’t predict how long the funding might be available. Relaxing at the end of the session, Benson is satisfied with her efforts.